Our ranking breakdown report shows that Windows is used more by high traffic sites, but with 46.7% usage within the top 1,000 sites it is slightly behind Unix also in that category. The top level domain breakdown report shows that, for whatever reason, Windows is quite popular in China (81.7%) and Brazil (55.5%), but its usage is below 15% in Russia, Germany, Japan and Poland. 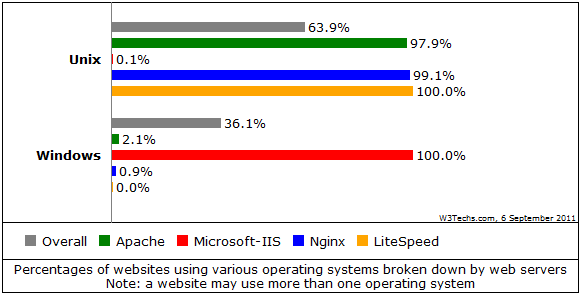 The web server breakdown report reveals that, obviously, Windows is the operating system that runs IIS, but it is surprising that only 2.1% of the Apache installations run on Windows. There is hardly a technical reason for that, because Apache runs just fine under Windows. Seems more like webmasters that run an open source server also prefer an open source operating system. The dominance of Unix on Nginx and LiteSpeed boxes is similar. 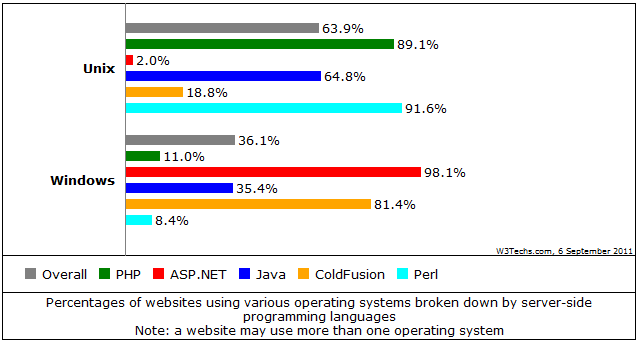 A look at the distribution of server-site languages shows that besides ASP.NET, Windows is also the dominating system for sites that use ColdFusion, whereas sites written in PHP and Perl clearly prefer Unix. Java is in-between, as the operating system distribution on Java sites is almost exactly the same as the overall distribution. 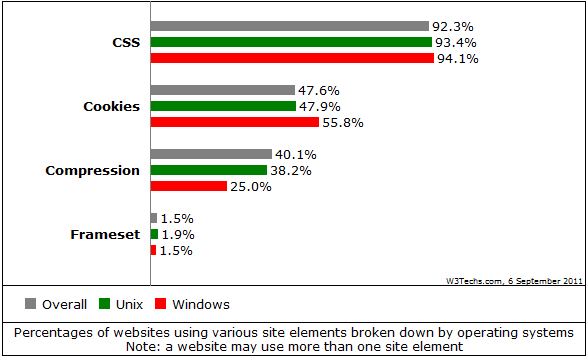 Another interesting fact is shown in the site element breakdown report: Windows sites use more cookies than Unix sites, but less compression. Our reports never show the reasons why some combination of technologies are more popular than others. Nevertheless, we hope that they help webmasters to better understand what the majority of their colleagues are doing and that may be an important input for their own decisions. 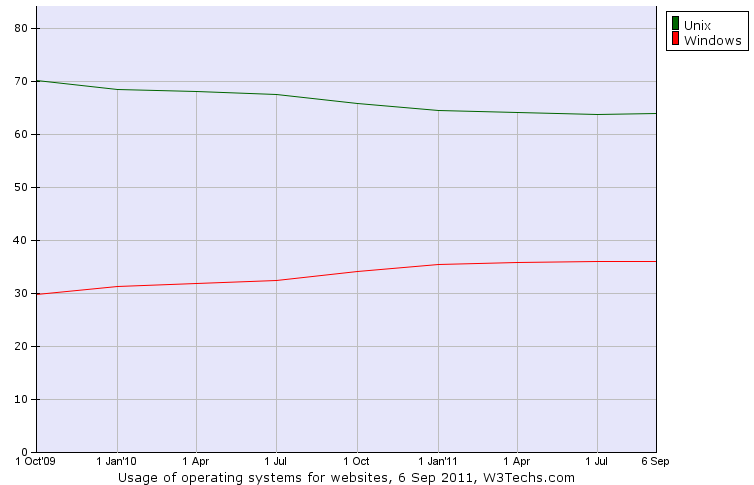 Surprising, but that's the way it is: most .cn sites use Windows.